‪Kauai #hitraffic update: This is new video of Hanalei Bridge. The water level has reached 14.6 feet. Kuhio Hwy remains closed in the both directions. Avoid the area, especially as more rain comes down. This video of Hanalei Bridge on Kaua‘i shows that the water level has reached 14.6 feet. VD Hawai‘i DOT. 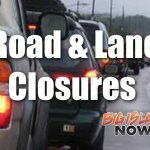 The record-breaking rain storm on Kaua‘i last weekend, April 14 and 15, 2018, has resulted in the DLNR Division of State Parks closing of four Garden Island parks. Parks that are closed include Napali Coast State Wilderness Park, Ha‘ena State Park, Polihale State Park and portions of Wailua River State Park. Currently, there are an estimated 30 campers stranded in the Kalalau section of the Napali Coast State Wilderness Park. Efforts are underway to contact people who have camping permits to check on their status or to determine whether they made it out of the park safely. The Division of State Parks is coordinating with Kaua‘i County and State Civil Defense personnel on prioritizing reconnaissance missions. All available helicopters on Kaua‘i are being managed based on immediate safety concerns. It is expected that Ha‘ena and Napali Coast State Wilderness Parks will remain closed indefinitely due to extensive damage caused to the road leading into both parks.